I should really call these posts “Random Interval Updates” instead of Weekly Updates. This one covers almost two weeks and it gives and update on Nicoleen’s and my credit card situation, links to a couple new VT posts, and let’s you in on some pretty exciting credit card news for those who love free travel. In the past random interval, I’ve pumped $10.15 in free gas. In this updates I only include gas pumped for commuting to and from work for myself. Personal miles for either of us and Nicoleen’s commute miles are not included in this figure. – Free Menards Stuff – The Verdict is the long awaited analysis from my 2-year experiment for which I bought my limit of every free-after-rebate item in every sale ad at Menards. Check out the post to see if it was all worth it in the end, and how much money one could make with this tactic. – Card Review – Wells Fargo Propel takes a look at the currently promoted premium points-earning credit card from Wells Fargo, the Propel World. You can easily get $650 value out of this card in the first year, with $450 of that being cold, hard cash! Read the review for the details and my assessment of the card. Nicoleen recently had three cards due for their first annual fee. She cancelled her Chase United Mileage Explorer after no retention deals were offered. She cancelled her Wells Fargo Propel World after no retention deals were offered, BUT she could have waited a few days and charged a $100 airline gift card, which would have been reimbursed by Wells Fargo, before cancelling. This was 100% my fault, as I neglected to think it all through properly before instructing her to cancel it. Her third upcoming annual fee was for her Barclay American Airlines Aviator Red. As I mentioned in the previous weekly update, Barclay seems to be working hard on customer loyalty with this card in the form of bonus offers and retention deals. Nicoleen was already 2 months into the “spend $500/month for three months and get 15,000 miles” bonus offer. Not only did they let her keep this offer going, they added the 3x miles offer I recently signed up for on my card, AND they waived her annual fee. After the short conversation the rep also apologized for it taking so long (which it didn’t at all, according to Nicoleen). Now that’s service! Southwest and Chase have bumped up the bonuses on the Rapid Rewards personal and business cards to 50,000 points each. This set-up enables one of the most coveted free travel bucket list items: getting a Southwest companion pass good for almost 2 years, and 110,000 points to use with it. The companion pass allows one guest to fly free with you on any flight you book, with cash or rapid rewards. Since Southwest is a discount airline, this means you could theoretically get 10 or more domestic round trip tickets with just two card sign-ups. For an excellent and thorough explanation of how it all works, and why now is literally the perfect timing for this deal to come around, check out Milevalue’s post on the subject. That’s all for now. It’s Tuesday, double coupon day at Super America. Time to go get $26.50 in free gas! 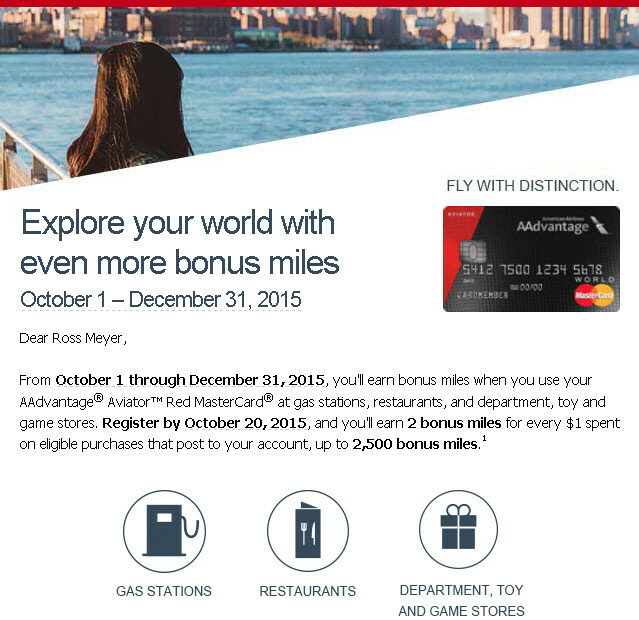 This entry was posted in Chase, Rapid Rewards, Southwest, Weekly Updates on October 13, 2015 by Gomanson.